This is a fairly large page with several topics and components. However it is also likely one of the most important topics in Emergency Medicine. It is broken down into 4 parts. a patient's airway - chin lift, OPA, NPA, rescue devices etc. 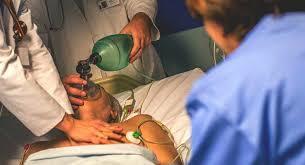 Fourth is "Rapid Sequence and Delayed Sequence Intubation"
Intubation usually then involves ventilating a patient. Ventilators are covered in the"Ventilators in the ER" page. The video below on proper Bag Valve Mask maneuveris also in the Power Point above but is presented here for ease of access. A technique called "High Flow Nasal Canulla" can deliver up to 60 liters per minute of humidified air and is being increasingly used in ER and even on the medical floors of even small hospitals. Doshi P et al. Ann Emerg Med 2018 Jan 6. High-velocity nasal oxygen may improve oxygenation and flush out CO2. High-velocity nasal insufflation of oxygen (HVNIO) involves use of a specialized cannula to deliver high-velocity oxygen to the nasopharynx. Theoretically, it can improve oxygenation and also improve ventilation by flushing CO2 out of the airways' dead space. Investigators conducted a multicenter, unblinded, randomized noninferiority trial to compare this method to bilevel positive airway pressure (BiPAP) in adult emergency department (ED) patients with respiratory distress. Patient eligibility criteria included no immediate need for intubation, no overdose, and clinician judgement of need for BiPAP. Below is a link to a MS Word AIRVO 2 Quicksheet for setup for Pediatrics and Adults. The Power Point link below covers the basics of invasive airway techniques - RSI and Cric. Although the 'last resort' airway technique, this has actually been greatly simplified in recent years. The formal, large and imposing 'cric kit' with many instruments and pieces that scared us all, has been replaced by a much simpler, 4 piece technique that is both faster and far less threatening to do. Even the bougie technique is being modified/simplified, which you will see in the second video. This section is on Needle Cricothyroidotomy. may not be that much quicker. However, in children below the age of 12, a needle cric is recommended over a surgical cric. Historically needle cric needed 'insufflation' equipment to attach to the needle. The video below shows some simple alternatives. What the video doesn't mention, is that failing having a 3 mm Peds ETT adapter, you can attach a 20 cc syringe to the needle hub, insert a 7 - 7.5 ETT tube, inflate the cuff in the syringe to form a seal and then bag the patient. This fourth and final section on Airway covers Rapid Sequence Intubation (RSI) and Delayed Sequence Intubation in more depth. The first Power Point covers RSI and DSI in general terms and the actualsteps. namely: Normotensive, Hypotensive, Increase Intracranial pressure and Asthmatic. The link below is on intubation with the head of the bed elevated. 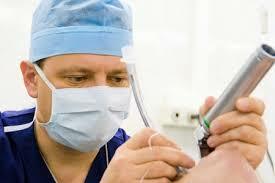 If done properly should not affect success rates for intubation. This is covered in the Power Point above, but for ease of access is summarized here. Face to Face intubation should be in your 'toolkit' for airway management, as the patient who is trapped upright (ie MVA), excessive vomiting/hematemesis, or difficult neck anatomy, may be best served by this technique. Decide on RSI meds below (16, 17, 18) – ask RN to draw up. Have someone get the ventilator, plug in and attach to wall Oxygen. Designate someone to watch monitor. Announce if Sats < 93% or MAP < 65 mmHg. Check for dentures – in for bag mask, out for intubation. Check neck for potential cricothyrotomy, have cric kit available. Have OPA, NPA and LMA available in proper size if not already in use. Pick ET tube. Check balloon with 10 cc air, leave syringe attached. Place stylet or have bougie handy. Choice of laryngoscope. Blade size. Check bulb working. Have spare laryngoscope handy. Suction – turn on, place handle under right shoulder of patient or under pillow. 16. Have Labetalol 20-25 mg IV on hand for elevated systolic pressure. 20. Give Drugs - announce to team "PARALYTICS IN"
22. Intubate – place ETT 23 cm to lips for males, 21 cm to lips for females. Inflate balloon. Secure tube. 27. Head of bed up 30-45 degrees. RR 10-14 bpm for Normotensive or Hypotensive. PEEP 5 or as needed for all except asthmatics. 0 for asthmatics initially. Give bronchodilators continuously for asthmatics. 30. ABG within 30 minutes post intubation. This video link below is a presentation by Dr. Jo Deverill from Australia on the difference between Direct versus Video Laryngoscopy and why he thinks 'DL is dead'. There are a host of You Tube and internet sites discussing RSI techniques which you are encouraged to search out. The important point is to get comfortable with your equipment ("Own It"). but become comfortable with them and remember always have a backup! The most important thing is to PRACTICE, PRACTICE, PRACTICE.